The Croatian island of Hvar is located to the south west of the country off the Dalmatian coast and is less than four miles from the mainland at its closest point. Hvar Island has four towns, namely Hvar (town), Sućuraj, Stari Grad and Jelsa. Hvar town, on the west side of the island is the largest town, the main tourist spot and also houses more than a third of the local population. Stari Grad, on the north west side is the second largest town and one of the oldest towns in Europe. For those travelling by ferry to Hvar Island, connections are currently available across the Adriatic Sea from Italy with a choice of routes operated by a number of well-known ferry companies. The sailing schedule is built around high season meaning that ferries operate only in July and August. SNAV operate the most frequent and fastest crossing which travels between Pescara and Havr town, though this service is foot passenger only. If you want to take a vehicle, then you’ll need to travel from Ancona to Stari Grad. 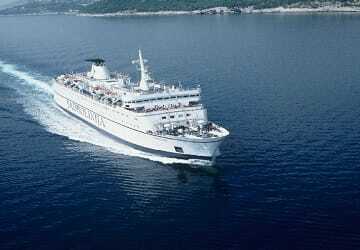 For more information, please visit our Ferries from Italy to Hvar Island page.